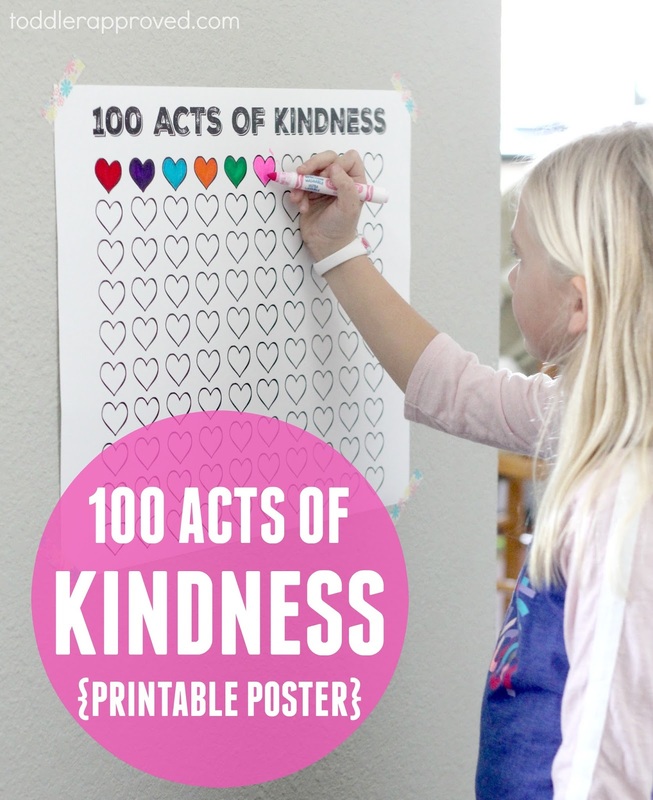 Did you catch my last post about our 100 Acts of Kindness Challenge that is starting in a little over a week? Each year around this time the weather can be bad and after the hype and fun or Christmas, it is easy to get a little depressed. I always try and plan fun things to look forward to in January and February to keep my spirits up and focus on others. Spreading kindness can be done year round and always makes me happy! Since January also tends to be a month where I feel the most frustrated with my kids (as we are stuck indoors together more), finding ways to strengthen our relationships and be more kind always helps us all be nicer. Each year we come up with a fun or unique way to record our 100 acts of kindness during our 4 week challenge. Last year we did a balloon countdown and the year before we made a kindness tree. This year we are keeping it super simple and we'll be using this printable 100 Acts of Kindness Poster. If you want to download our poster and print it out for yourself, click on the link below to download it. The image I created is for an 16x20 poster. I uploaded this image on Costco.com and then ordered a large 16x20 poster in the photo section. It is the perfect size. 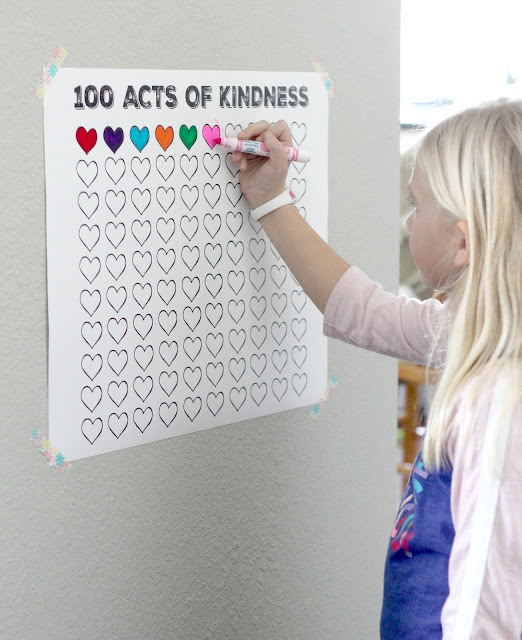 You can use it with markers or crayons or you can just stick a sticker on each heart as you accomplish each act of kindness. Posters are between $7-8 at Costco. You could also use Vistaprint or another online printing store. If you want to print it out on cardstock and have it smaller, that should work too. If you share about our printable poster online, please make sure you link back directly to this post. Our printables are Copyright protected. Please don't alter the image in any way. My kids are SO EXCITED to get started on our challenge in less than a week! We are already making a list of what acts of kindness we plan to do. You can also grab an adorable countdown image created by Coffee Cups and Crayon HERE if you want to try another fun idea! Don't forget to join our 100 Acts of Kindness Facebook group to keep up to date on all of the Kindness Challenges we will be sharing! Let me know in the comments if you plan to join us! I can't wait!